William Martin Hinshaw2,10 [William Meredith Hinshaw3,7, William H. Hinshaw11]. Born Mar 16 186510 [May 10 18651,3, Jun 10 18652], Randolph County, Indiana10. request to be joined in membership with friends, this meeting united in receiving them and appoints Levi Cox Irum Harris Annie Harris Wm M. Cox and Mary E. Cox to inform them of their reception into membership visit them for their help and encouragement and report to next meeting. Annette died Feb 16 18922,15; age 23y 7m 16d2,15 [Fountain Park Cemetery14]. 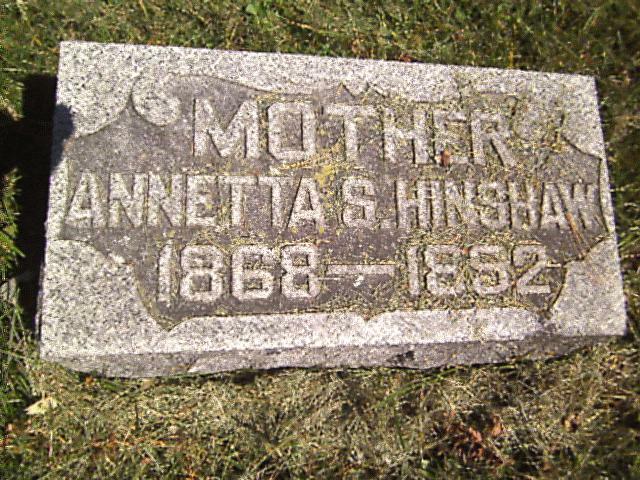 HINSHAW Anetta S., d/o Hugh and Sarah (Dunn) Gard b. Aug. 31, 1868 - d. Feb. 16.1892 ae 23y 7m 16d. Married Wm. 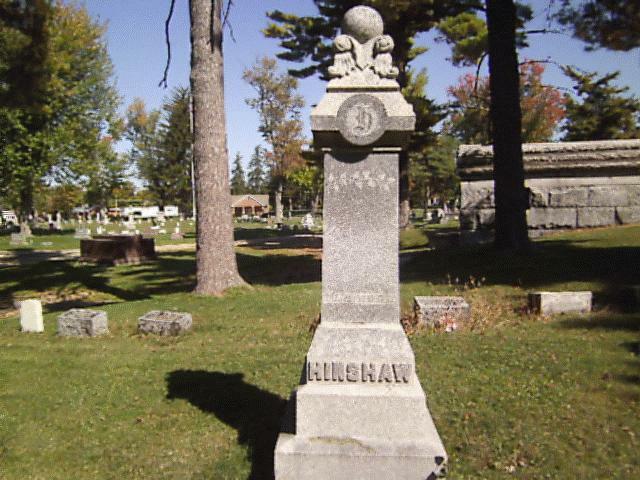 M. Hinshaw June 14, 1884. She was a mem. of the Soc. of friends. Surv. are the husband and 5 children, father, mother, 1 sis and 1 bro. Bur. Mt Zion Cem. (Death Rec. lists her as "Nellie". Cause of death was inflamation of the stomach and bowels). He then married Arvilla Merles Platt3,12 [Arvilla Merlea Platt1, Villa Platt17], Oct 4 18953,12, Randolph County, Indiana3,12. Arvilla, daughter of George Platt & - Fudge1,3,5,9,14, was born 18781,3,5,9,14 [Jun - 187617,18], Randolph County, Indiana1,3,5,9,14. 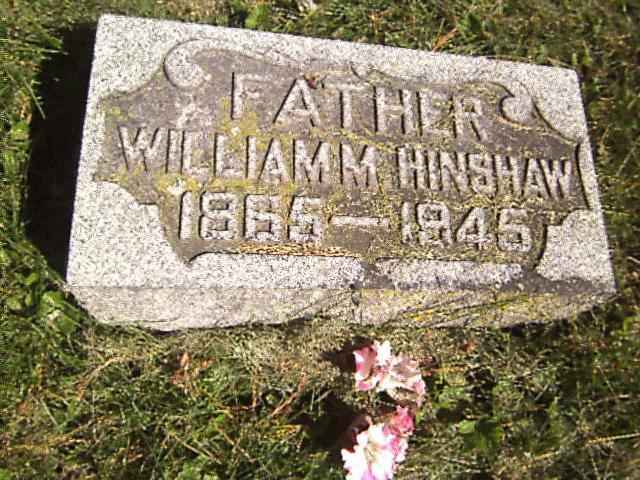 William Hinshaw, head-of-household, age 34, born Mar 1865 in Indiana; parents born in Ohio; married 5 years; farmer; owned farm. Villa Hinshaw, wife, age 23, born Jun 1876 in Indiana; father born in Indiana; mother born in Ohio; married 5 years; 2 children, 2 living. 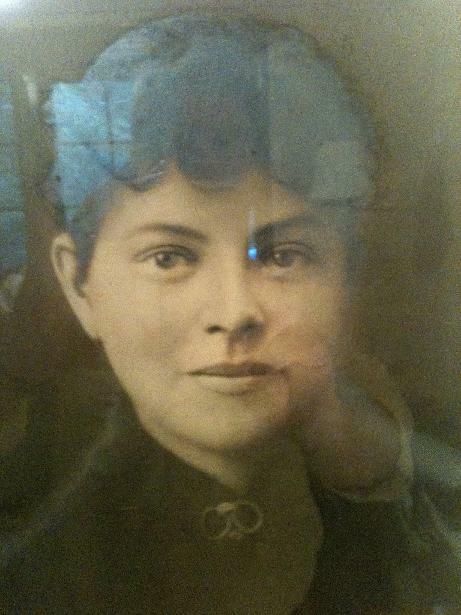 Edna Hinshaw, daughter, age 15, born Apr 1885 in Indiana; parents born in Indiana; attended school. Fana J Hinshaw, son, age 13, born Jul 1886 in Indiana; parents born in Indiana; attended school. Ople Hinshaw, daughter, age 11, born Dec 1887 in Indiana; parents born in Indiana; attended school. Lyda Hinshaw, daughter, age 10, born Nov 1889 in Indiana; parents born in Indiana; attended school. Tracy Hinshaw, daughter, age 8, born Nov 1891 in Indiana; parents born in Indiana; attended school. Lillian Hinshaw, daughter, age 3, born Sep 1896 in Indiana; parents born in Indiana. Dewey Hinshaw, son, age 1, born Aug 1898 in Indiana; parents born in Indiana. Hinshaw, William M, head-of-household, age 54, born in Indiana; parents birthplaces "unknown"; owned home; occupation: farmer, general farm. Hinshaw, Arvilla M, wife, age 41, born in Indiana; parents born in Indiana. Hinshaw, Mildred J., daughter, age 16, born in Indiana; parents born in Indiana. Hinshaw, Kenneth C., son, age 12, born in Indiana; parents born in Indiana; attended school. Hinshaw, Margaret, daughter, age 5, born in Indiana; parents born in Indiana. Hinshaw, Dewey W., son, age 21, born in Indiana; parents born in Indiana; occupation: farmer, cropper. Hinshaw, Glenna M., daughter-in-law, age 19, born in Indiana; father born in Ohio; mother born in Indiana. Hinshaw, Clarence W., grandson, age 7 months, born in Indiana; parents born in Indiana. Hinshaw, Wm. M., head-of-household, age 64, born in Indiana; father born in Ohio; mother born in Indiana; first married at age 20; owned home; radio in home; occupation: none; not a veteran. Hinshaw, Arvilla, wife, age 51, born in Indiana; parents born in Indiana; first married at age 17. Hinshaw, Kenneth C., son, age 22, born in Indiana; parents born in Indiana; occupation: teacher, public school; not a veteran. Hinshaw, Margaret L., daughter, age 15, born in Indiana; parents born in Indiana; attended school. Hinshaw, William, head-of-household, age 74, born in Indiana; completed 8th grade; on Apr 1 1935 was living in the same house; owned farm ($1200 value); occupation: farmer, farm. 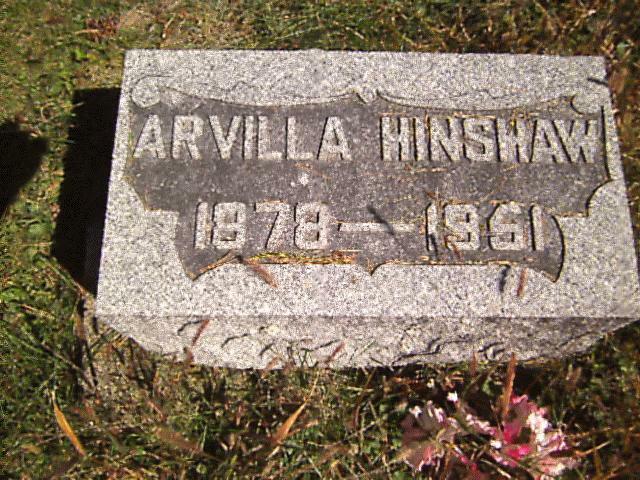 Hinshaw, Arvilla, wife, age 66, born in Indiana; completed 8th grade; on Apr 1 1935 was living in the same house. William Martin Hinshaw died Dec 11 19457,12 [Dec 7 19451,2]; buried Fountain Park Cemetery, Winchester, Randolph County, Indiana7,12. 1920 census, Washington Township, Randolph County, Indiana; roll T625-464, ED 159, page 16A, line #17, dwelling #432, family #433. Interview with Miriam James Hinshaw. 1930 census, Washington Township, Randolph County, Indiana; roll T626-624, ED 17, page 2A, line #46, dwelling #39, family #39. 1900 census, Washington Township, Randolph County, Indiana; ED 129, sheet 2A, line #27, dwelling #30. 1940 Census, Washington Township, Randolph County, Indiana; roll T627-1089; ED 68-17, page: 3A, line #32, household #52. 1920 census, Washington Township, Randolph County, Indiana; roll T625-464, ED 159, page 16A, line #14, dwelling #431, family #432. 1930 census, Washington Township, Randolph County, Indiana; roll T626-624, ED 17, page 2A, line #40, dwelling #37, family #37. Photo courtesy of Michael Brian Hardy.